Some of my favorite photos from yesterday. Click to embiggen. "This is all about winning a championship. And if we get satisfied (with) one effort, then...you know, we're not going to win it." 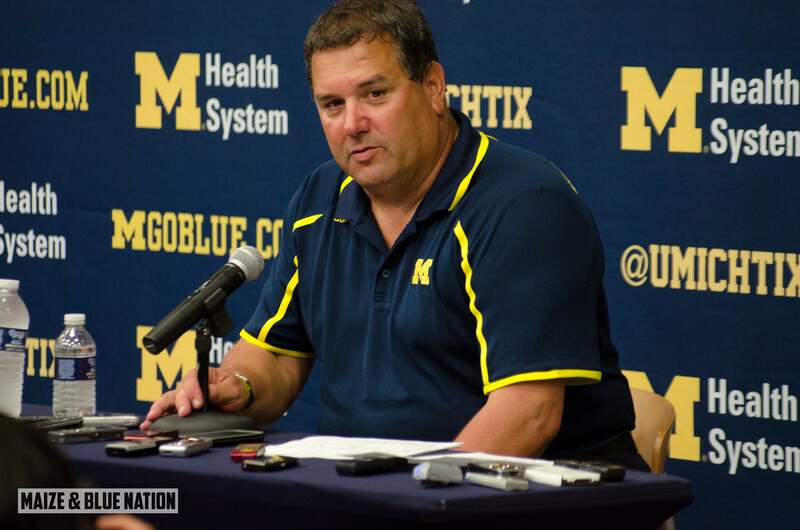 -Brady Hoke, post-game. The day went as planned. Invite an inferior MAC opponent over for an afternoon of feasting, pay them handsomely for their trouble, add a check mark to the win column, get a ton of young guys some much-needed game experience, dust off those offseason cob webs for bigger and better opponents coming up. For all intents and purposes, Michigan did all of those things. A couple guys got a little banged up, but all-in-all, a successful outing for the Maize & Blue, and a nice start for Team 134. As you can imagine, putting 59 points on the scoreboard usually means things went well offensively. (Btw, most opening game points for UM since Yost in 1905 against Ohio Wesleyan). Aside from a couple throwing miscues, the offense looked solid. Chalk it up to opening game rust, I suppose. It was nice to see Shane Morris get a lot of reps, though. It was great to see Fitz Toussaint back out there. While he only garnered 57 yards rushing on 14 carries, his two touchdowns were smashmouth. Leading the way on the ground, statistically, was true-freshman Derrick Green with 58 yards on 11 carries and a score. The kid just has a special feeling about him. I think he becomes a regular contributor going forward. But he is a lot of dude. All 6 RBs on the depth chart played in this game. While Green got the most attention from his 30 yard rumble, I thought DeVeon Smith got some nice looks. Drake Johnson, Thomas Rawls and Justice Hayes also got some touches. Devin had some nice scrambles, including 2 for touchdowns. The maize & blue faithful held their breath every time he left the pocket though. But I think Devin's field presence and awareness often get ignored when he's talked about. There were a few times when the pocket was collapsing, and Devin felt the pressure and knew to take off. In the open field, he can simply make guys miss with ease. He's faster than he looks. Truly impressive. All told, Michigan ended the day with 242 yards on the ground on 47 attempts and 6 touchdowns. One of the more important stats for me: No fumbles. Joe Reynolds had a nice day but left the game a little banged up. There's no doubt Jeremy Gallon is the go-to receiver. Drew Dileo is also a playmaker in the slot. Those guys had nice days. 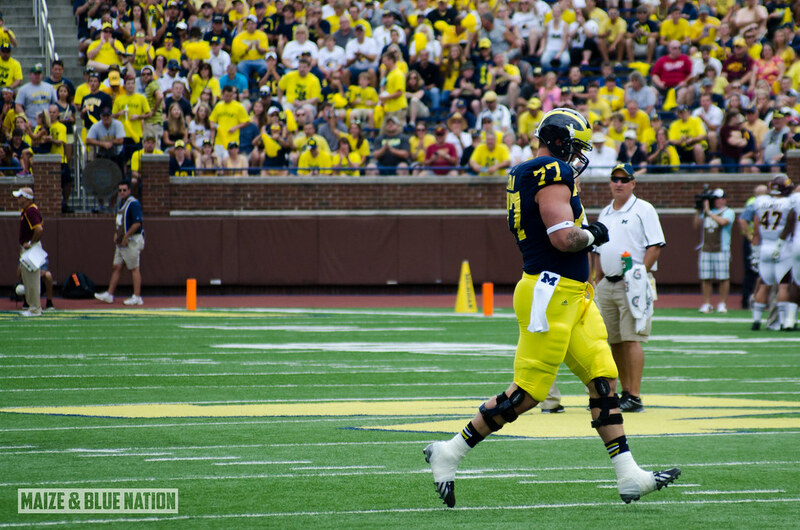 Devin Funchess, also had a nice outing, left with what Hoke called a cramp. It was either that or he took a shot to the mid-section. Either way he was in some pain. He will be fine, though. The interior offensive line played well enough for me not to notice anything bad. Obviously, CMU being what they are is not the biggest test for this line, but it felt like they were playing well as a unit. We had some nice "manball" moments, especially near the goal line. Notre Dame will be a much bigger test. We'll know a lot more a week from now. The defense was ridiculous. Twenty-four players notched at least 1 tackle in this game. Desmond Morgan led the way with 7 tackles, Stribling and Furman each had 5. Cam Gordon had a nice day filling in for the injured Jake Ryan with 4 tackles. In the backfield, we mentioned Stribling and Furman, but Jarrod Wilson had his name called quite a bit. I thought he, Raymon Taylor and Blake Countess all played well. Thomas Gordon sat out this game due to a violation of team rules. He will be back this week against the Irish. Given Michigan was starting two brand new safeties, I think we can all agree this is probably the best that can be expected outcome. The focus for everyone on defense was the line. That's where Michigan really showed off their depth. CMU's OL isn't exactly Notre Dame's, but they're not that bad either. 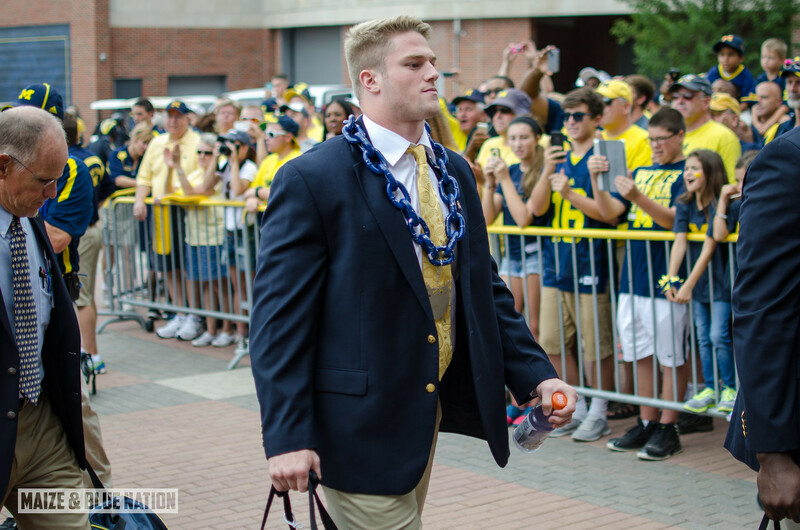 I thought Michigan did a good job getting guys rotating through and keeping guys fresh. I think aside from one big drive by CMU in the first half, they only had 1 first down through much of the half. So that's one easy way to keep guys fresh. Frank Clark had some nice un-blocked looks at the quarterback. Seemed like Mattison blitzed really well on passing downs. I thought a lot of the young guys looked young, and that's expected. But it's great to be able to get them out there. But it wasn't all sunshine and butterflies. We mentioned the poor throws that led to interceptions, but Michigan also missed a lot of tackles. They played a little sloppy. More than a few times, guys ran themselves out of position by over-pursuing. There were also quite a few penalties. A lot of that can be blamed on first game jitters...so if things don't improve in those areas next week, then it's time to be concerned. The blocked punt may be what most folks take away from this game. It was a great way to start the game, that's for sure. Gibbons was solid, as expected. It was all PATs until he nabbed a 30-yarder in the 4th. 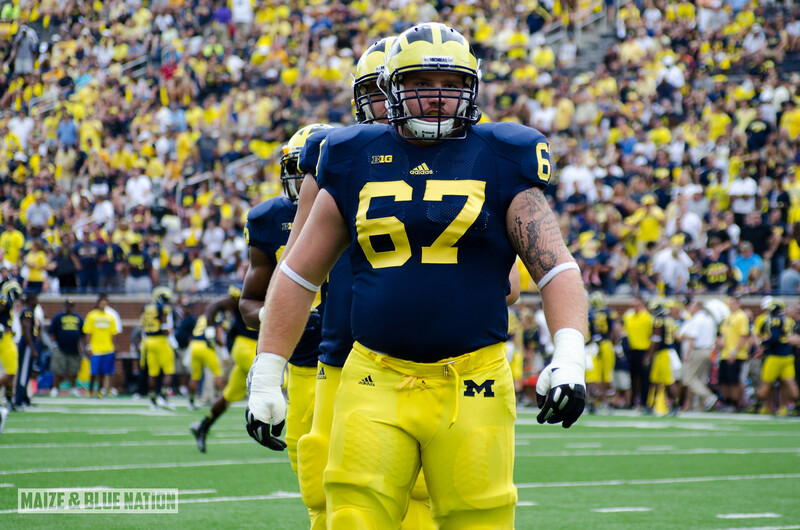 Michigan only punted once, and it was not Matt Wile handling the duties. Kenny Allen booted a nice 51-yarder in the 4th quarter. I would suspect Wile is the number one guy, though. Every time an opponent kicks off, I think to myself this is going to be the one. 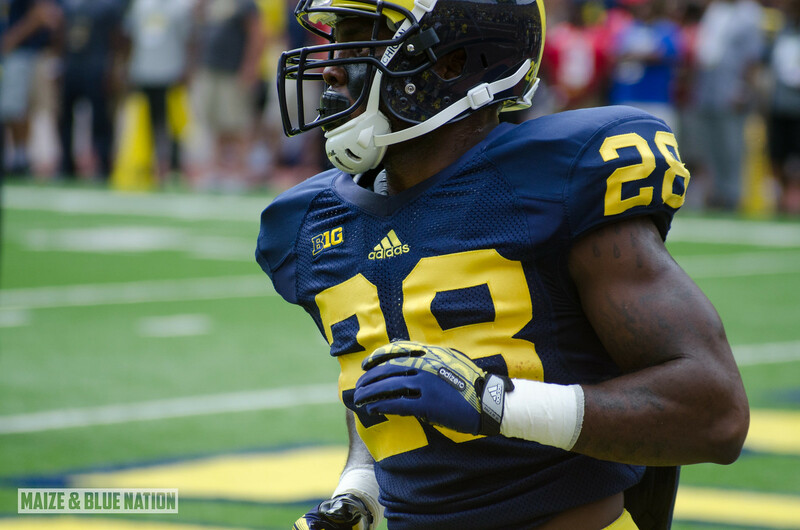 That's what Dennis Norfleet does for you. He's Steve Breaston 2.0. He had some nice kick returns yesterday. Although, he needs to work on his punt returning decision making. He almost gave one away early in the game. They were plentiful. Have at 'em. 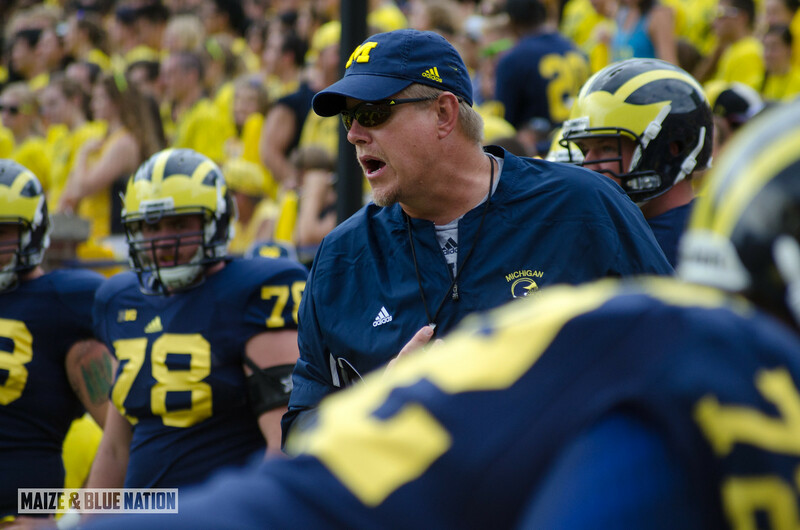 Game breakdowns via MGoBlog, UMGoBlog, Maize & Brew, Big House Blog, Touch the Banner. Dr Sap's Decals. 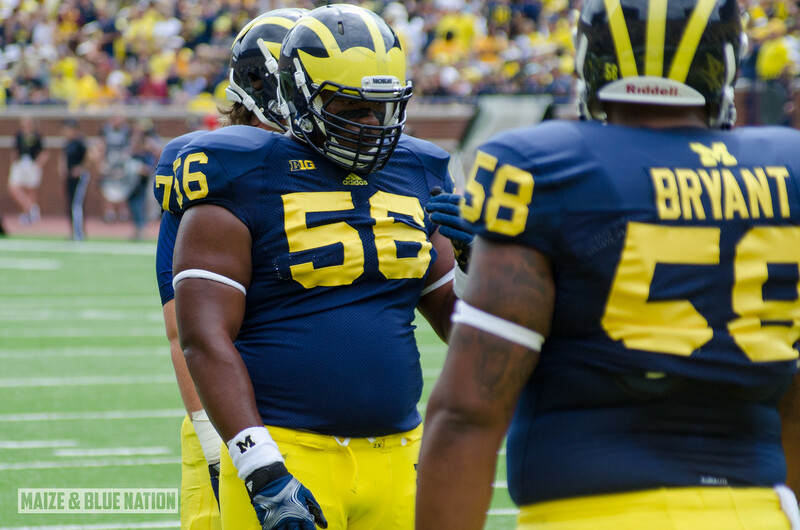 Photo galleries from MVictors (pregame), MGoBlog, UMGoBlue. The marching band brought it strong with a 007 inspired halftime show. And they dropped this one on us (image via BTN). Seeing as how it was Michigan that first scripted the famous OHIO back in 1932, I figure that gives them leeway to "modify" the spelling a tad. The #jetpackguy was a nice touch as well. A lot to prepare for going into Notre Dame week. Should be a lot of fun. I mean, hey, College Gameday is comin' to our citaaayy! For more of my CMU/Week 1 coverage, hit these links.